“GT” stands for grand-touring, if you’ve forgotten. And the new Scorpion EXO-GT920 is certainly a grand touring helmet. Replacing the EXO-900X that came before it, the GT920 adds more than just twenty digits. First up we have the base model Scorpion EXO-GT920 Helmet, still available in your favorite colors (provided they’re Black, Matte Black, or Gloss White). The most noticeable difference will be the updated design, the GT920 is sporting a brand-new polycarbonate shell. With better aerodynamics, lighter weight, and redesigned venting - the GT920 will feel like a new helmet (mainly because it is). A few key features are retained, namely the spectacle-friendly KwikFit cheek pads, KwikWick II liner, Everclear no fog face shield, and SpeedView retractable light smoke sun visor. The inflatable cheekpad system has been done away with, much to the chagrin or delight of would-be customers, depending on who you ask. Alongside the three solid colors of the GT920, they are also releasing the Scorpion EXO-GT920 Satellite Helmet. Available in Silver, Red, and Hi-Viz colorways, the Satellite is a futuristic, cleanly designed paint scheme for an already stylish helmet. Sharp geometric shapes with colorful accents tie the graphic together. You’ll likely see it on the silver screen in a Blade Runner remake. If you’ve got $300 burning a hole in your pocket and want the best modular helmet you can buy, the new EXO-GT290 isn’t a bad choice. 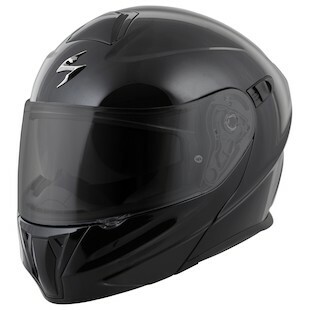 Blending the affordability of a polycarbonate construction with the style and features of much more premium brands, Scorpion is definitely making a name for themselves in the motorcycle helmet corral.